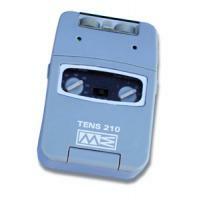 The TENS 210 is a battery-operated two-channel transcutaneous electrical nerve stimulator that creates electrical impulses. Intensity, duration, number per second and modulation of those impulses can be altered with easy to use controls or switches, all in a light-weight package. Weight: 4 ounces (battery included). Dimensions: 3.7" x 2.6" x 0.9". Warranty: Device 1 year, lead wires 90 days. Output Current: 1 — 80 mA into a 500 Ω load Constant Current. Output Voltage: 0 — 100 Volts. Battery: DC 9 V battery, alkaline or rechargeable nickel-cadmium. Battery Life: Approximately 70 hours at nominal settings. Wave Form: Symmetric, biphasic rectangular pulse. Pulse Rate: 2 — 150 Hz. Pulse Width: 30 — 260 μs. Modulation Mode: The pulse width of successive output pulses is automatically varied in cycle pattern over an interval of nominally 6.5 seconds. 1. Pulse width decreases linearly over a period of 0.5 seconds from the control setting value to a value which is 60% less than the set value. 2. The narrower pulse width is maintained for 2 seconds and then increased linearly over a 0.5 second period to its original value. 3. The pulse width is then maintained for 3.5 seconds at the control setting. Burst Mode: Bursts have an adjustable pulse width with a frequency of 100 Hz. Bursts occur twice every second. TENS/EMS Units & Stimulators can be found in our extensive online collection of products from globally recognized and trusted brands, including Mettler Electronics. An excellent option to consider is the Mettler TENS 210 Unit.